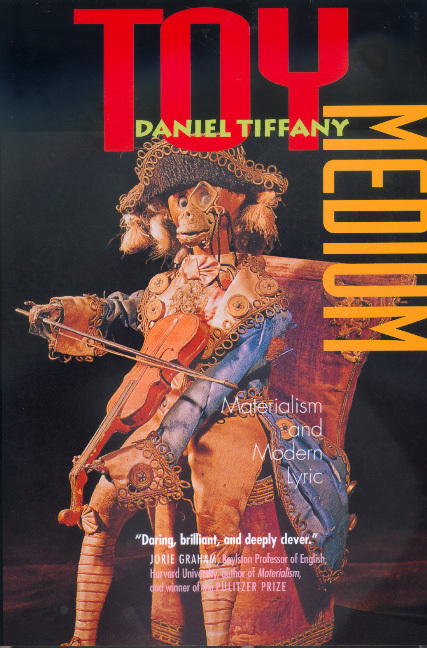 What begins with an unlikely collection of unrelated phenomena--mechanical dolls, weather, atoms, lyric poetry--blossoms in the course of Toy Medium into a subtle and persuasive meditation on one of Western philosophy's biggest puzzles: the relation of mind and matter. What is the role of the imagination in defining material substance? In a dazzling study of the poetics of materialist philosophy and of the materialism of lyric poetry, Daniel Tiffany traces the historical conjunction of matter and metaphor through a remarkable range of topics: automata in classical antiquity and the eighteenth century; Kepler's treatise on snowflakes; animal magnetism; fireworks and cloud-chamber photographs; the origins of the microscope as a philosophical toy and its bearing on the figure of the virtuoso. At critical junctures in modern Western culture, Tiffany finds uncanny parallels between the metaphorics of science and visions of material substance rooted in popular culture and lyric poetry. Daniel Tiffany is Associate Professor of English and Comparative Literature at the University of Southern California. He is the author of Radio Corpse: Imagism and the Cryptaesthetic of Ezra Pound (1995).